Description: The Shell Knot is simply a curved diamond with diagonal rows of Double Half Hitches that pop upward. 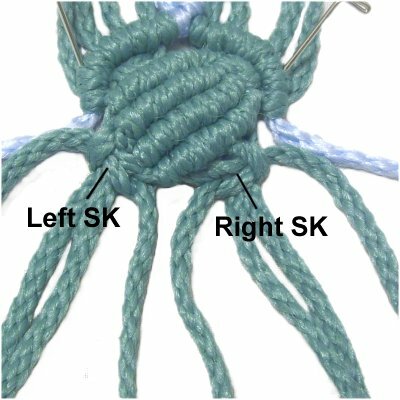 In vintage patterns, this technique is often named the Berry Knot, or a Nut Design. The key to making it look appealing is to use slender material and to tighten the knots as much as possible. You could add this decoration to decorate handbags, plant hangers, wall hangings, or in curtain patterns. 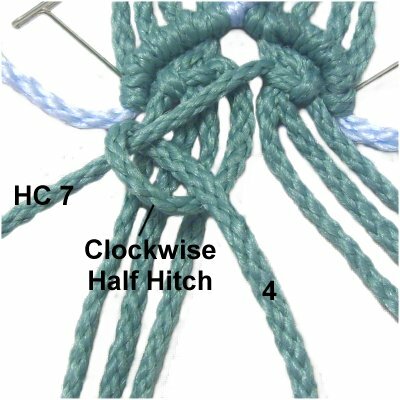 Make sure you know how to tie the Double Half Hitch diagonally in both directions. 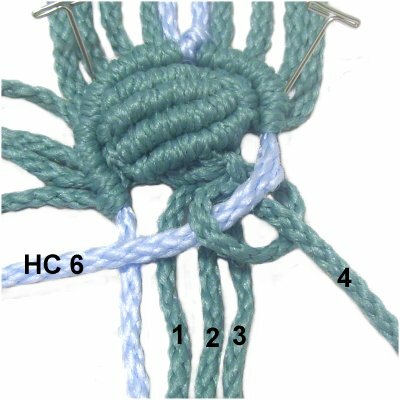 Practice controlling the holding cord with one hand while tightening the knot with the other hand. 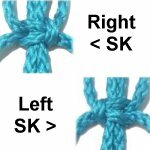 The Square Knot is an important part of this design, so be sure to practice tying both left and right variations. 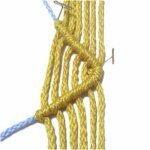 Want to make a project after you learn the Shell Knot? 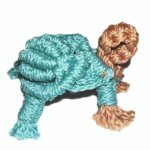 This Mini Turtle is a beginner's project based on this knot. Step 1: Fold a holding cord in half and secure it vertically on your board. Place two 36-inch working cords on each side of the holding cord, after folding them in half. Mentally number the cords 1- 10. The holding cords should be 5 and 6. 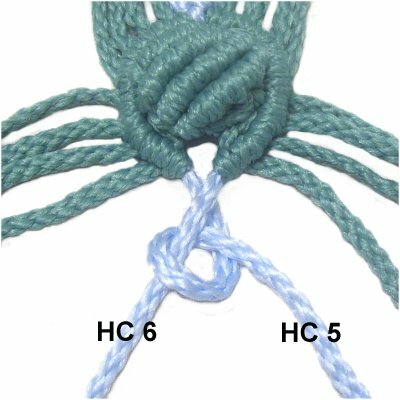 Cross cord 6 over cord 5, and secure it diagonally towards the left. 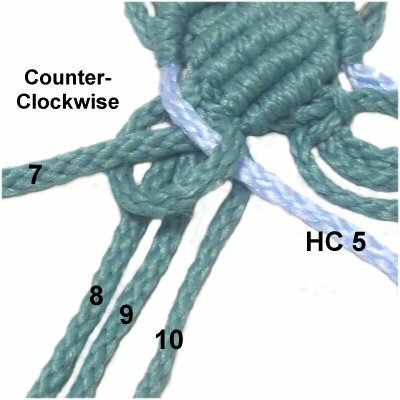 Use cord 5 to tie a clockwise Double Half Hitch (DHH) onto cord 6. 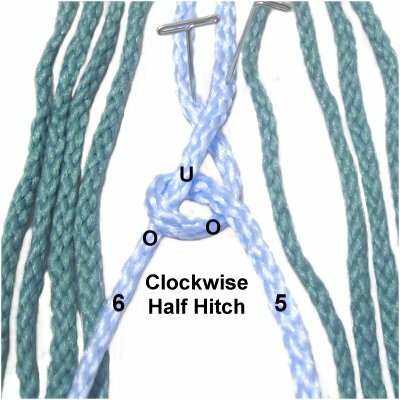 A single Half Hitch is tied by making a loop over - under the cord holding the knot (cord 6). Designer's Tip: It's important to tighten ALL the knots as much as possible. Step 2: Place holding cord 6 on top of the working cords on the left. Attach cords 4 - 1 to it with clockwise DHH (in that order). Step 3: Move holding cord 5 to the right, resting on top of the working cords. Attach cords 7 - 10 to the holding cord with DHH, rotating counter-clockwise. Step 4: Tie a LEFT Square Knot using cords 1 - 4. Make sure it's very tight and rests against the row of DHH. Encourage the DHH above it to curve (see step 5). 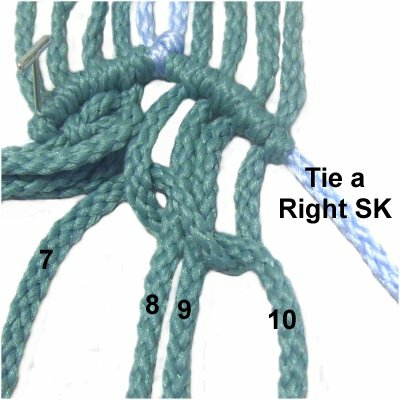 Tie a very tight RIGHT SK with cords 7 - 10. Encourage knots above it to curve. 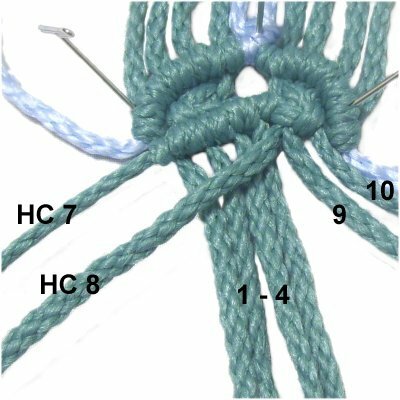 Now you will work on the center portion of the Shell Knot, which is made with four rows of diagonal DHH. 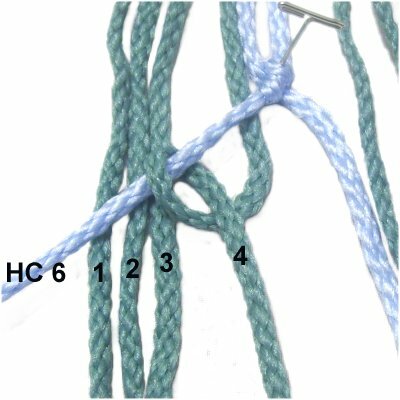 Cords 7 - 10 are used to hold the knots, and 1 - 4 are used to tie them. The original holding cords (5 and 6) are not used, so push them aside for now. Step 5: Move holding cord 7 to the left, resting on top of the working cords. It should be close to the Square Knot on the left. Secure it (or hold it) with tension. 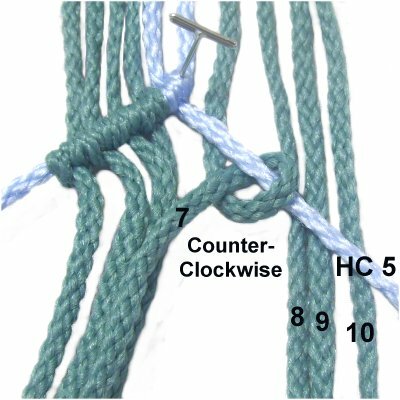 Use working cord 4 to tie a clockwise DHH onto holding cord 7. Tighten both Half Hitches as much as possible, and pull on the holding cord so the two SK are close together. Step 6: Move holding cord 8 to the left, resting on top of the working cords. 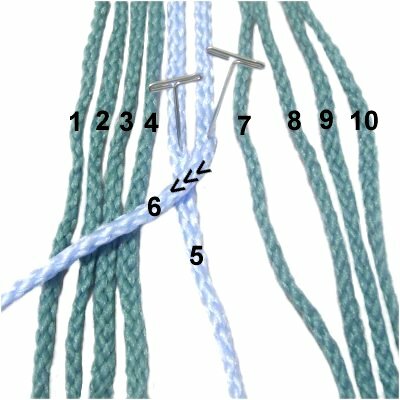 Follow the tightening instructions below as you attach working cords 1 - 4 to holding cord 8. Pull the holding cord towards the previous row with one hand (diagonally), while pulling the working cord with your other hand. Make 2 more rows of DHH in the same manner. Use holding cord 9 for the 3rd row. Use holding cord 10 for the 4th row. 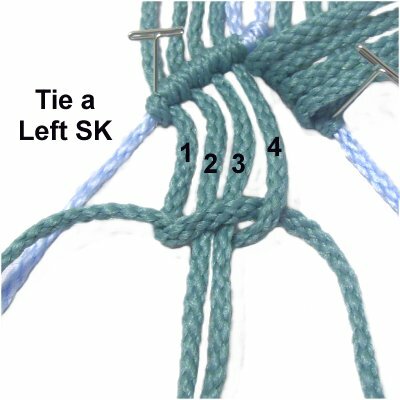 Step 7: Tie a left SK with the four cords on the left (holding cords 7 - 10). Make sure these knots are as tight as possible. Designer's Tip: The center portion of the Shell knot should pop upward slightly, but you may need to give it some help by pushing it from below. Check to see if there are any obvious gaps between the rows of DHH. 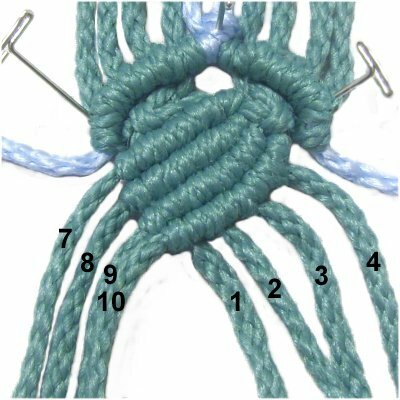 Go back and tighten the knots more if necessary, to eliminate those gaps. Now you will make the lower edge of the Shell Knot. Remove the pins from holding cords 5 and 6 (light blue in images). Step 8: CURVE holding cord 5 towards the center of the shell (right). Attach cord 7 - 10 to it with counter-clockwise DHH. 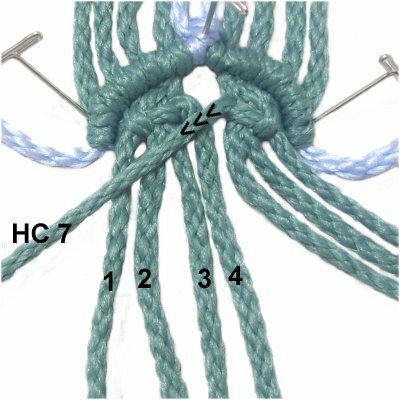 Push the knots close together, so the first one you tie (cord 7) rests against the DHH in the upper shell. Move holding cord 6 towards the center (left). Attach cords 4 - 1 to it with clockwise DHH, in that order. Push the knots close together, so the first one rests against the DHH in the upper area. 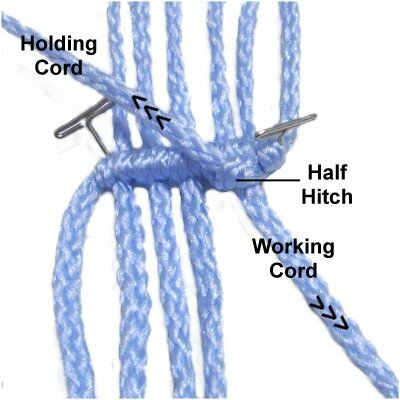 Important: Pull both holding cords as much as possible, so the Shell Knot becomes round. The outer portion needs to be very close to the 4 rows of DHH. Your goal is to hide the Square Knots, so keep making adjustments until the knot is round and neat. Step 9: Bring holding cord 5 under holding cord 6, and attach it with a clockwise DHH. Push down on the SK in the lower right area just before tightening the DHH. 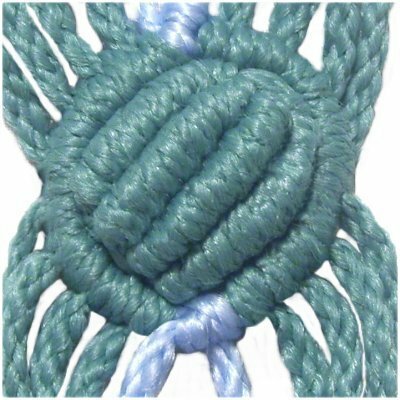 Have any comments about the Shell Knot? Contact Me.